The prism of motherhood has put me through my paces. I try to reconcile the two realities of time moving that I face. 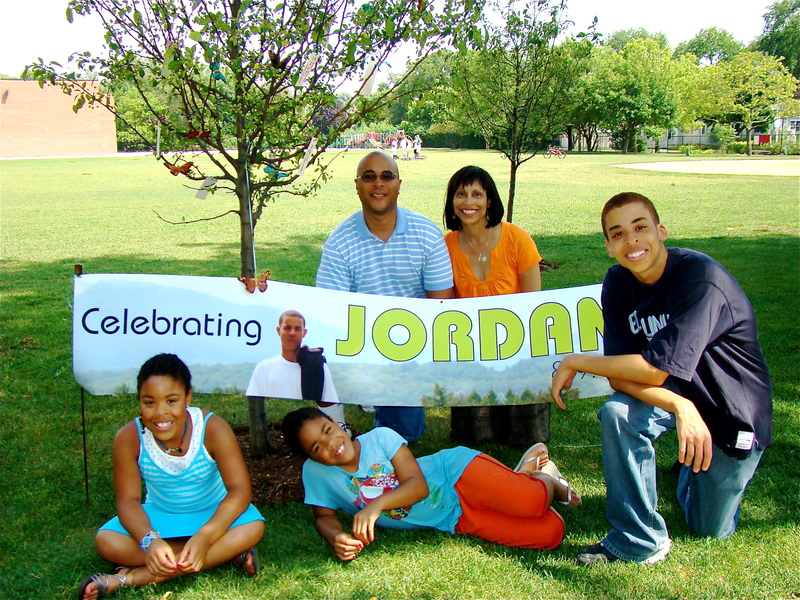 I have Jordan stopped in time in 2008 and my children who keep me in the present. Happy New Year (? ), I’m not sure that phrase will ever slip easily from my lips. In the midst of my resistance to time having the audacity to move forward as I try so desperately to redo the past, are my beautiful children who beckon me forward. My daughters in their excitement ask for the hundredth time just to be sure, “Mama can we stay up until midnight” My son requests, “Mom, can you get sparkling cider for New Year’s Eve?” Of course to all their questions the answer is yes. Yes, we’ll ring in the New Year. We’ll toast the end of 2009 and the beginning of 2010. We’ll spend New Year’s Eve as a family all having our longing for Jordan, but also a need to welcome a new year. My ambivalence about New Year’s Eve started right after Christmas. I found myself angry that the principles of Physics could not be applied to change how I needed time to work. January 2010 means the start of the 2nd year without my boy. I know I’ll never stop marking time by how long he’s been gone. Marking a year without Jordan was heartbreaking, and yet it was closer to when he was alive. The passage of time is moving me away from when my child was on this earth. Where is the healing in that reality? Even as I struggle to find the strength to move forward, the other facets of my motherhood prism present themselves in working order. A few days ago I was conscious of my behavior as I moved through the drugstore intending only to buy batteries for Merrick’s camera and toothpaste. Right next to the batteries was a display of New Year’s party items. Before I knew it, I was buying horns and sunglasses in the shape of 2010, imagining the kids at midnight as Mark and I took pictures. I knew the kids would like the horns and glasses and that made me smile. 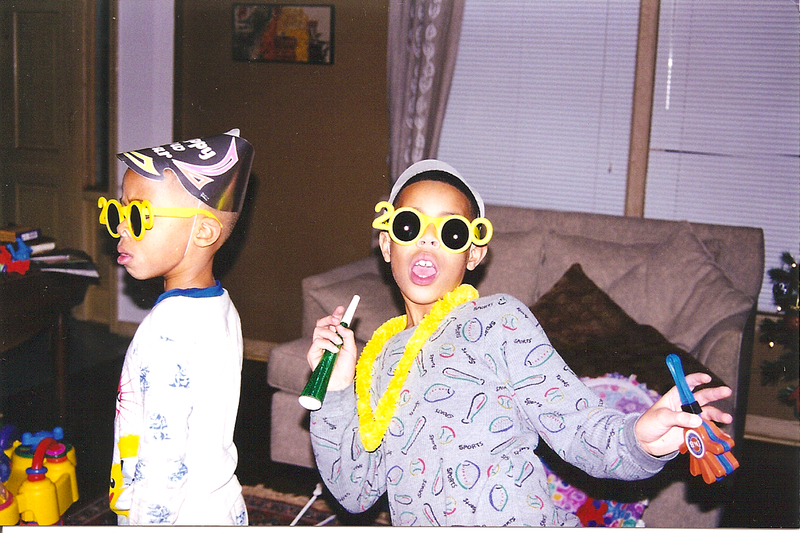 There was only a brief hesitation as I remembered Jordan and Merrick on New Year’s Eve in the new millennium, wearing sunglasses in the shape of 2000. “Have ten years really gone by?” would have been a question of wonderment before Jordan died. The passage of time would have been my only thought as I picked the new sunglasses, which now included some for the girls who were babies in 2000. Time now is a passage between past and present; the future is still a place I’m not ready to face. Making it through one day, one moment, one breath is all the planning I can handle now. When I think of the past it is where six resides. The past is where the question, “How many for dinner?” was always answered “six.” When our family of six traveled by plane we sat three and three. Now, as my family learns to be five I watch the faces of strangers as they smile and look at our little family, sometimes saying, “You have a beautiful family.” I say thank you, but inside I say more. Inside I cry out “we’re really 6 not 5. 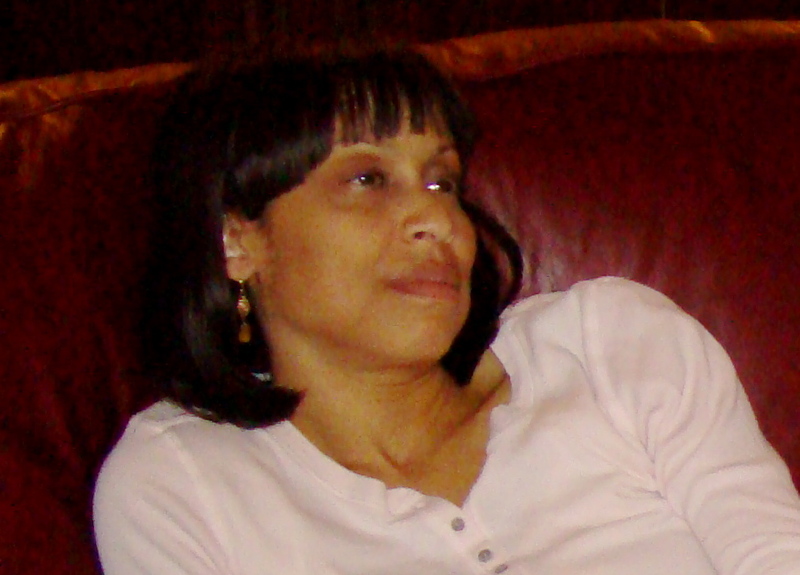 I have an older son, he’s not with us anymore.” I never reveal that detail unless someone asks me how many children I have, but it is always on my mind. We went downtown a few days ago, so the girls could go ice-skating and Merrick could check out a new comic book store. As we walked in our typical fashion with Mark in the lead and I bringing up the rear, to make sure there were no stragglers in the bunch, I watched my family with wistfulness and pride. Jordan’s spirit swirls around and within us. Our love for him is so vast. We all miss him and are blessed to be able to share our fun and wonderful memories and our sorrow and tears over losing him with each other. Our family is being reconfigured and it is an evolution. Being five is not by choice but it is new and strange and providing comfort all at the same time. My children are my gifts; my marriage is my respite and my blessing. My family is the touchstone for all that I do and the reason I continue to believe that love is what heals and keeps my heart going. This is the second year that the clock will chime twelve and I won’t hear Jordan’s voice. But, like last year at midnight we’ll sing out his name to an open sky. He’ll hear us and know he’s never forgotten. Happy New Year Jordan, you are eternally my son, I am eternally your mother. Two weeks ago on Mark’s birthday as I shuffled through the mail to get the cards sent by family and friends to put on the table with the gifts for Mark to open, I saw the letter from the funeral home addressed to Mark. I knew what it said without having to open it. We had yet to pick up Jordan’s remains from the funeral home and I knew the letter was telling us it was time to come and pick them up. Tonight was not the time for Mark to see this particular piece of mail. I placed it underneath a pile of catalogs to make sure Mark wouldn’t see it. This was a piece of mail I would make sure he didn’t open or even see on his birthday. I retrieved the cards and proceeded with our typical birthday rituals. Before I went to bed that night I found the letter and opened it knowing I would wonder about it all night if I didn’t open and read it. As I had known, the letter did say it was time to pick up Jordan’s remains. I went to bed that night sleeping off and on but spending most of my time telling myself it was time, we needed to bring Jordan home. The next morning as Mark dressed for work I told him about the letter from the funeral home. He told me he would call them and handle the arrangements for setting up a time to pick up Jordan’s remains. Later that day Mark confirmed with the funeral home that we would pick up Jordan’s ashes the week after Thanksgiving. I had a week and a half to prepare myself to do what I hadn’t been able to do for over a year. Having Jordan cremated had been one of the easier decisions we had to make after Jordan died, because he’d made it for us. On one of our Thanksgiving drives to Ohio when Jordan was in high school, I was telling Mark my father’s desire to have his ashes spread in the hills of West Virginia near a lake where he played as a child. Jordan chimed into the conversation and said that his desire when he died was to be cremated as well. He appreciated the eco-friendly aspects of cremation and liked the idea that his ashes could be in a place or places that he wanted them to be. We never dreamed that Jordan’s request would have to be honored by us, his parents. This year all the way to Ohio and the entire time we were there I kept thinking of Tuesday, the day Mark had arranged for us to pick up the remains. I didn’t know if I could go, but I didn’t want Mark to go alone. Tuesday came and Mark came home from work early. We sat in our family room and I told him I wasn’t ready to go to the funeral home that day. I explained to him that bringing Jordan’s ashes home meant all the tricks I’d been using to have moments of denial were being stripped away. His remains, the real proof of our loss would be in our possession. I asked him, “Why does it have to be today?” All he answered was that he had arranged this time and was ready to go and bring Jordan home. He explained to me that if I couldn’t go, it was okay he would go by himself. I immediately objected to that scenario and asked, “Can’t you get someone to go with you if I can’t go?” Mark looked at me with tears in his eyes and explained why picking up Jordan’s remains and bringing them home was something he felt was our responsibility. When Jordan was born, there was a part of that experience that was just between you and Jordan. I have always honored and respected that bond and that aspect of nature. When I left the hospital after Jordan’s birth it was about 5:30 in the morning. I remember going to Denny’s to eat breakfast and telling the waitress that I was a new father and I had a son. Before I went home to rest for a while, I bought a newspaper to have as a keepsake of the day Jordan was born. 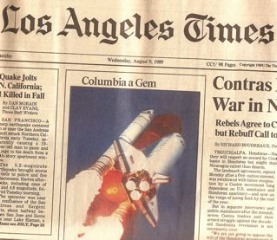 I always loved that newspaper cover because it had the picture of the shuttle Columbia being launched the day before. I just remember thinking what a perfect cover for the day my son is born. The sky is the limit for him. When I brought you and Jordan home from the hospital I did it with love and the responsibility that comes with being a husband and a father. Now it’s time to bring our boy home again. I brought my little family home when he was born. I’m going to bring my son home now. I have to. Image of the newspaper Mark bought on the day Jordan was born. I didn’t push anymore after Mark explained how bringing Jordan’s remains home was so intertwined with his role as a father. I just asked him to give me one more day to ready myself so that I could go with him. To prepare myself I needed to have an idea of what the container would be like and what if any process we would have to follow. I called the funeral home and told them we wouldn’t be coming that day but would be there the next day. The lady assured me that was fine; we could come any day that week that worked for us. I then asked if we needed to call before we came. She said no. I stumbled a bit as I took a breath and tried to formulate the most burning question I had. Through many “um’s” I finally told her that to prepare myself I needed her to describe in what type of container we would be picking up our son’s remains. She very gently and patiently explained that the remains were separated into four plastic bags as we’d requested and would be in a cardboard box. A cardboard box was how we would find our boy. We had requested the ashes be separated into four bags because we planned to bury part of Jordan’s ashes in the memorial garden in our backyard, so that a part of him would always be home with us. The other bags would go with us as we travelled to places Jordan had planned to go on his adventures. We will take his remains and spread them at the places he dreamed of going but didn’t live to see. The funeral director came to the door and welcomed us in with a, cordial and gentle, yet professional manner. He shook our hands and told us to have a seat. We sat for a few minutes and I watched the housekeeper vacuum the room used for services. Suddenly the funeral director was back with an evergreen colored shopping bag, the funeral home name and logo on the side. It was the same green shopping bags they used to give us the extra programs, photo displays and the guest book from the memorial service. He gave Mark a paper to sign, and then explained that the best type of container to put the ashes in would be one with a wide opening. As he spoke I wondered if the container we had chosen was going to work. I didn’t think it would, but I didn’t have the strength to speak. We were then on our way. It had taken us 414 days to come back to the funeral home and only five minutes to pick up the remains of our son. As we walked to the car with Mark carrying the bag, I saw the elderly Asian woman across the street, hand still in her pocket crumbling bread and then stealthily dropping crumbs into the bushes where birds flocked. I wanted to think about this woman and whether this routine was something she did every day. I started to make up a life story and a routine for her as we walked to the car. I watched her as she walked down the street to her next feeding spot. Thinking about her meant not thinking about the bag Mark was placing in the backseat. Mark held the bag and I looked away, not ready to look inside the bag to see the cardboard box; a box no different from any box that had been shipped to our home carrying items ordered from catalogs. There was the irony, how could the same kind of box that I had opened and used so many times before now hold the remains of one of my most precious loves. I couldn’t look in the bag. Mark came around to the driver’s side and we were both in the car with the doors closed. I sat staring straight ahead not able to speak. Mark asked me if I wanted to go home and I shook my head no. I told him I just needed a few minutes. I asked, “Can we just sit here a few minutes so I can get myself together?” He nodded yes and placed his hand on my leg. I looked out the window at the funeral home and then the tears came. No words came out only moans, sobs and tears. I cried for all that we’d lost and the pain that accompanied every step and transition we had to make in accepting the death of our son. We had the ashes of our son in the car with us. We were taking him home. We had avoided this step for over a year because it signified a truth and finality that I couldn’t fully embrace. I still want my boy to come home. The bag in the backseat says unequivocally that he won’t, he can’t. I didn’t want to face this moment. 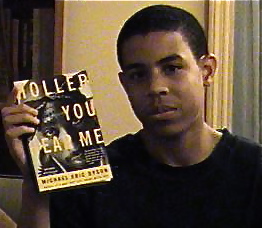 I wanted to continue to find a way to undue time and fix October 12th, 2008. The bag in the backseat, which held Jordan’s remains, was taking us down a different path. A path that held a future of days, celebrations, and memories that Jordan wouldn’t ever experience. I wept until no more tears came. I took a breath, looked at Mark and told him I was ready to go. We pulled away from the curb; I exhaled and told Mark I wasn’t ready to go home yet. We decided to go to lunch. Even as I said the words, “Let’s go to lunch”, I felt insane. What were we doing acting normal and doing something as mundane as having lunch when the shopping bag was in the backseat? The whole lunch was such an out of body experience. I knew that we were postponing going home and putting Jordan’s remains in the place we had decided on because taking a little more time meant that we didn’t have to face the truth that the bag held. I watched myself go to a local Greek restaurant, make small talk with my husband and eat lunch. I ate food after going to the funeral home to pick up my son’s remains. It was surreal watching myself have this typical experience meshed with the unimaginably painful sojourn we’d just crossed. I’d been placed in a world that felt undone. Finally, it was time to go home. When we pulled into the driveway, Mark hurriedly got out of the car and bounded up the stairs. He forgot the shopping bag. As he unlocked the back door to our house I called out to him, “The bag is still here. I looked at the bag and hurriedly said, that’s okay I’ll get it.” The automatic side door slid open and I picked up the bag, still not looking into it. Not looking into it didn’t matter anymore; the weight of the bag surprised me. I hadn’t known what to expect, but I wasn’t imagining that the bag would be so heavy. Mark quickly took the bag from me and I said out loud, “It’s heavier than I thought it would be.” All he said was, “I know.” Mark took the bag and put it in the living room. We had allowed ourselves time to get Jordan’s ashes, place them in our home and deal with our initial feelings before the kids came home from school. We decided that they aren’t ready to know that his ashes are home. For now Mark and I own this information and the emotions it brings for our children and us. Somehow the hour got late and we still hadn’t transferred Jordan’s remains to the container we had chosen. I looked at Mark and said, “Merrick will be home in about an hour we need to take care of it.” We both wearily got up from our seats in the family room and with the same dignity and somberness we’d shown at the viewing of Jordan’s body opened the box. Mark had retrieved the container we were going to use, and I dusted it off even though it was already clean. We sat side by side, I on the corner of the couch, he in the chair next to the couch and he pulled out a plastic bag of ashes. As soon as I saw the bag I knew we’d have to get a new container, the opening of the one we had was too small. Mark attempted to put the bag in but it didn’t fit. As I looked at the bag suddenly all the memories I had of my child flooded back and blurred together. How could this be? The baby I brought home from the hospital swaddled in blankets was now ashes contained in a plastic bag. Mark put the bag back into the box, and I began to scream. I screamed and I screamed. I screamed and the words, “No”, and “I want my boy”, and “He’s my baby, he’s my baby” echoed through our house. I pounded the walls, I wailed, I wanted to leave. I screamed until I was hoarse and my throat was raw. Mark got me to sit and held me as I moaned and sobbed. We had been given our beautiful baby boy to bring home to love, nurture and raise. Now we sat looking at a box of ashes that used to be our vibrant, firstborn son. Our boy is gone. We will take care of his remains and do our best to honor his memory by spreading his ashes and making some of his wishes and dreams come true. No matter where his ashes travel, he’ll always be my baby. I won’t ever stop longing for him.